On December 31, 1906, Holiness preacher Gaston Barnabas Cashwell opened a revival in a tobacco warehouse in the Harnett County town of Dunn. Cashwell became the informal leader of the Pentecostal movement in the Southeast, and the Dunn revival has been hailed for it place in Holiness history. 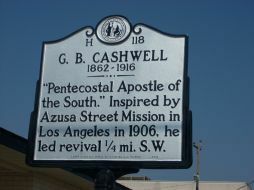 Several movements adopted Cashwell’s Azusa Street message. Cashwell’s revival in Dunn challenged the region’s Holiness churches to redefine their theological doctrines, uniting many of them in Pentecostalism.